From East is East (1999) to Cemetery Junction (2010), there is no doubt that over the last decade or so British cinema has had a penchant for producing refreshingly unique comedy gems. However, no matter how brilliant these films are, the sad matter of fact is that they are constantly overlooked in favour of more mainstream, Hollywood blockbusters. Sadly this is a hole that Submarine (2010) may have fell into as it was forgotten by many casual cinema goers upon its release, but by no means does this mean that it's a bad film. Set in Wales in 1986, Submarine is narrated by its protagonist Oliver Tate (Craig Roberts) who recounts the story of how he had to juggle his first 'romance' with his pyromaniac girlfriend and the possible demise of his parents marriage due to a suspected case of infidelity which involves his mystic neighbour. Even though Submarine marks the directorial debut of The IT Crowd actor Richard Ayoade it is an extremely confident film that shows no signs of his lack of directorial experience. Not only did he direct the picture, he also wrote the screenplay, which was adapted from the little known novel of the same name by Joe Dunthorne. Nothing but praise can be given to Ayoade for this particularly stylish feature. The film is extremely well edited and is split into three parts, reminiscent of chapters in a book. Certain moments of the film feature speed manipulation; a brilliant yet subtle trick that emphasises the urgency or loneliness of the characters' situations. The script is brilliantly written, comical, witty and smart. In no way does Submarine resemble the typical teenage romance/coming of age dramas that are constantly being pumped out which tell the tale of two relatively popular, ridiculously good looking teenagers falling in love who must overcome an epic obstacle to be together. Instead, this film follows two protagonists who, maybe only on the surface, appear to be completely normal. The central love story of the film isn't necessarily a traditionally romantic one and this is what makes Submarine stand out from its peers, a romance film is far more interesting when the lead male and female hate the prospect of actually being romantic. Aside from this tale of (almost) romance, there is a brilliantly funny subplot in which Oliver attempts to understand the mechanics of his parents' marriage and just how their mystic, new age guru neighbour is seducing his mother. L-R: Jordana Bevan (Yasmin Paige) and Oliver Tate (Craig Roberts). Craig Roberts' portrayal of Oliver is flawless as not only does he do the brilliantly written script justice, he also brings in a sense of nostalgia for other favourable yet downtrodden male youths such as Bud Cort's Harold in Harold and Maude (1971), even to the point of having a slight physical resemblance to the young Cort. Oliver Tate is a protagonist who leads a relatively mundane life yet is an incredibly interesting character who partakes in activities such as; 'light arson', surveilling his parents and, in a typical cocky schoolboy manner, he also fantasises about how much people would mourn his death. Oliver isn't a stand alone protagonist; cue his girlfriend Jordana Bevan (Yasmin Paige). Jordana is seemingly similar to Oliver, though somewhat slightly more confident than he is. A pyromaniac who finds acts of bullying amusing, she is a slight sadist in her own strange yet empathic way. Being a female character who hates the prospect of romance, she's a rare character for a teenage romance film, yet another trait that makes her so perplexing. Just as Roberts does with Oliver, Paige brings the role to life in a blunt yet fantastic way. Though Submarine may not be as memorable as other films from its time of release it's a thoroughly enjoyable film that fell into the sad trap of being shunned, most likely due to the lack of big names, CGI effects and explosions that most 21st century cinema frequenters crave. Despite this it's extremely difficult to find any faults. The style, cast and script are immaculate; all the things that a perfectly enjoyable film requires. 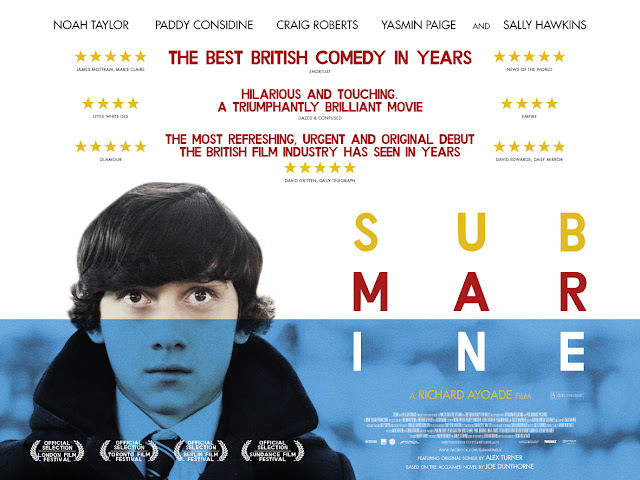 Submarine is ultimately a very funny, witty and clever film that can be enjoyed with ease. Its made greater by its protagonist, who is one of the more unique and interesting characters in film. Though its humour may not meet the tastes of international audiences it is British comedy at its best. We can only hope that Ayoade continues his phenomenal work behind the camera and makes a follow up film. It's also a must see if you're a Wes Anderson fan. I love British cinema as well, far better than most Hollywood blockbusters. I love This is England and Billy Elliot. Also, I agree 100% with your verdict on this film, fingers crossed that they'll be more to come! Saw this movie last summer, absolutely adore it! definitely a british comedy! loveee the film.